Saints N Sinners and The Unplugged Project are colouring the evening of 12th October in the colours of the awe-inspiring, and charismatic Amitabh Bachchan! Join us in the festivities following his birthday and dance to the tunes of all his classics! From Khaike to Mach Gaya Shor, we are leaving nothing unsung. 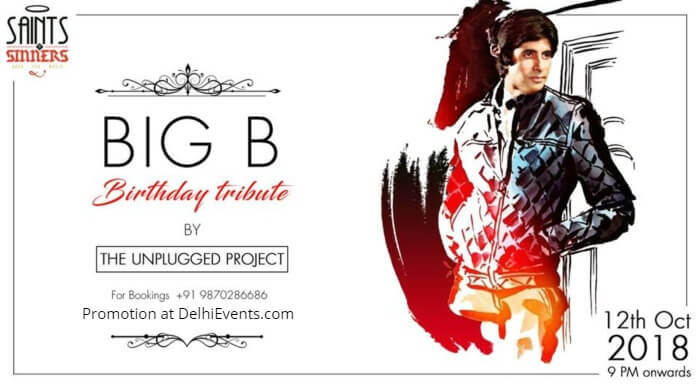 The Unplugged Project is a popular acoustic band from Delhi specialising in high-energy music for festivals, colleges, weddings, pubs, corporate events, and private functions. The band consists of lead singer and guitarist- Aditya Jassi, singer, and guitarist - Manish Gunthey, Ashwani Verma on drums, Abhay Sharma on the saxophone, and Vinayak Gupta, vocalist on the keyboard. Unplugged draw their musical influences and inspiration from rock, folk and country music. Unplugged is a collaboration between Manish Gunthey, Aditya Jassi and Ashwani Verma. The band performs a mix of Bollywood contemporary covers and retro Hindi music, English pop, rock and contemporary music. By using their engaging vocal style and their own unique improvisation on cover songs, Unplugged enthralls audiences with their outstanding musical performances.